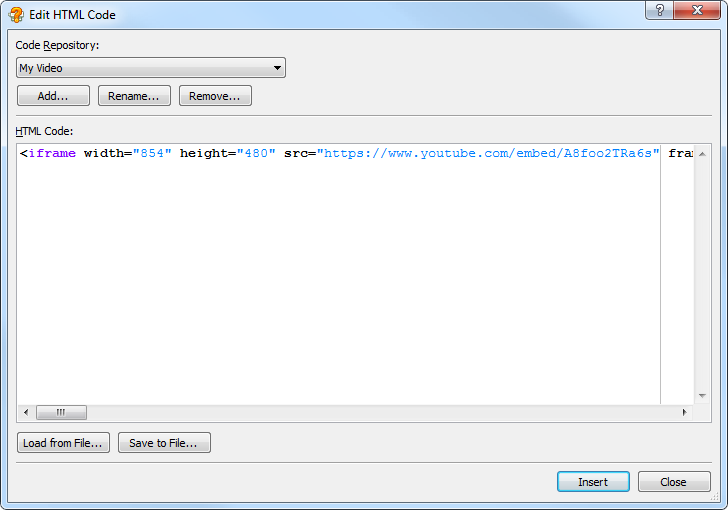 If you need to insert a video clip from YouTube into your help system, you can use the HelpSmith’s possibility to insert custom HTML code in order to accomplish that task. Open your video clip on YouTube website. Right-click on the video clip, and copy the HTML code by selecting the appropriate command. In the word-processor, put the cursor in the place where you want to insert your video clip. On the Insert tab, in the Placeholders group, click HTML Code. In the drop-down menu, click Insert HTML Code. In the dialog box, add a new code entry by clicking Add, and then paste your code by pressing Ctrl+V. You can learn more about using custom HTML code insertions in HelpSmith here.